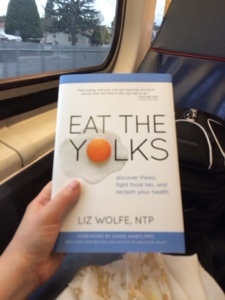 My preordered copy of “Eat the Yolks“! Anyway, that’s what I’m doing on the train today. In other news, I’m sick. Remember this? Yeah, that’s all a thing now. I’m heading home to roast some chicken so I can make broth. That seems like a lot of work for chicken soup. I wish you could buy the real stuff in a can these days. Wow, I just hit “Publish” instead of “add picture.” Whoops. So, if you are revisiting this page, sorry for this new addition and all of the typos and grammatical errors prior to proofreading. Anyway, what I meant to say was that MSP airport has seriously upped their game in the G Concourse. I had a layover last night, and while rummaging up some grub for dinner I found they had kale chips for sale. Kale chips. And GF cookies. The good bakery kind, not the box kind that taste like sawdust. Holy wow. And instead of uncomfortable chairs by the gates, they have little booths with iPads you can use for free. You can even order a cocktail while you wait for your flight. 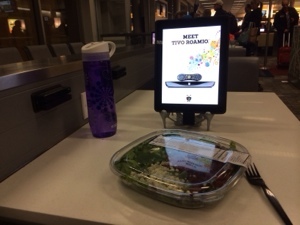 I enjoyed my spinach salad with a side of free iPad. And I still had food in the fridge to rummage up a lunch this morning, yay! 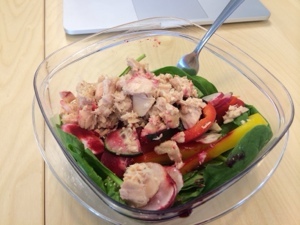 Le tuna and veggie salad. Time to dive in to some “Yolks”, I’ll let you know how Iike it! On the Road. Or Air. Thank you! 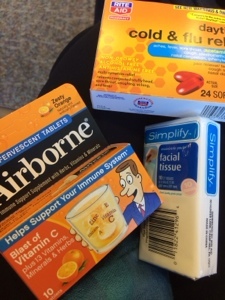 Those darn sniffles.